But the moon isn’t about to sit out on all of the raucous fun of 2018. In fact, she’s planned a pretty major comeback for January 31st, a raincheck for her mellow December 31st, one might say. And if the name of the comeback is any indication of what’s in store for the actual event, it looks like we’re in for quite the ride. The super blue blood moon is around the corner. Are you ready for it? Here’s everything you need to know. #1 WHAT DOES “SUPER BLUE BLOOD MOON” MEAN? + SUPER: Supermoons are full moons that occur during the point in the moon’s orbit that brings it closest to the earth. Because of the moon’s proximity, it appears much brighter and larger than it would otherwise. Supermoons occur relatively frequently, with an average of four to six supermoons each year. + BLUE: Blue moons are the second full moon to occur within a calendar month. Does the phrase “once in a blue moon” ring a bell? As you may have guessed, blue moons are relatively rare, occurring only once every two to three years. Spoiler alert: blue moons are rarely blue in color. It is possible for the moon to appear blue in color, but one of the only known circumstances to make this happen is the heavy presence of volcanic ash in the atmosphere. A super blue blood moon is simply the occurrence of all three of these events at the same time: it’s a full moon at the moon’s closest point to earth during its orbit, it’s the second full moon of the month, and it passes through Earth’s shadow. #2 HAS THIS EVER HAPPENED BEFORE? Surprisingly, the answer is yes. 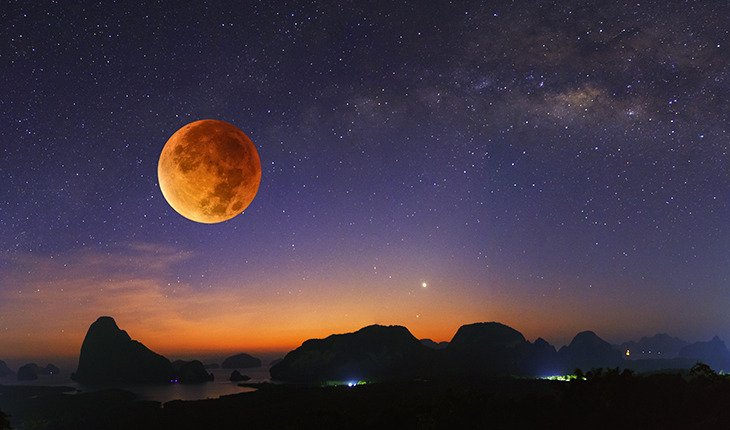 Though it seems unlikely with the number of factors playing in to such a lunar event, Time reports that according to retired NASA astrophysicist Fred Espenak, the last total lunar eclipse during a super blue moon was as recent as December 30, 1982. Other sources estimate that it’s been as long as 150 years since the last event of this kind, but we’re going to stick with the NASA astrophysics on this one. If you’re wondering why “super blue blood moon” doesn’t sound familiar, it might be because the naming terminology really only became popular in the last two decades. #3 WHAT’S THE DIFFERENCE BETWEEN A LUNAR AND A SOLAR ECLIPSE? A lunar eclipse and a solar eclipse involve the same processes—they just use different pieces. During a lunar eclipse, the earth comes between the moon and the sun, obstructing the sunlight that would typically reflect off of the moon’s surface. During a solar eclipse, the moon comes in between the earth and the sun, blocking sunlight that would otherwise directly be hitting the earth. The big difference to note between the two is how you’re supposed to view them. For a solar eclipse, it is extremely dangerous to attempt to view the eclipse directly without proper eye protection. For a lunar eclipse, you aren’t looking directly at the sun’s rays, but rather a reflection of them. Therefore, there is no eye protection necessary. #4 WILL THE SUPER BLUE BLOOD MOON ECLIPSE MAKE ME ACT DIFFERENTLY? This is the fun part—if something as simple as a full moon can change the behavior of flora and fauna, will there be even bigger changes during a super blue blood moon? Astrological expert Susan Miller has some answers for us. According to Miller, eclipses typically accompany big life changes, both endings and beginnings. Since the moon represents personal relationships, a lunar eclipse is a particularly ripe time to see a change in an important relationship. Eclipses are also characterized by changes in illumination—you may receive an outpouring of signs or signals about your life that you haven’t noticed before. Each lunar event is also closely tied to the astrological sign in which it occurs. This super blue blood moon belongs to Aries, the sun sign. Like their mascot the ram, Aries are characterized by fierce leadership, individualism, and determination. If you’re an Aries, this is your time to let that Aries flag fly: own your independence and use your fire to take charge of a new and exciting relationship or project. If you’re not an Aries, you can still learn from that Ram-like persistence: suit up, take up that task that you’ve let sit on the back burner for too long, and start the new year with impressive productivity! #5 WHERE AND WHEN CAN I SEE IT? The super blue blood moon will be in the sky from sunset on January 30th to sunrise on January 31st. The peak of the eclipse will be at 5:29 am PST, or 8:29 am EST on January 31st, meaning that west-coasters will have the best chance of a clear viewing. Eastern portions of the U.S. will not be able to see the full eclipse due to the rising sun, but will still likely be able to observe the some of the other signatures of the event, notably the bigger, brighter moon, throughout the night.